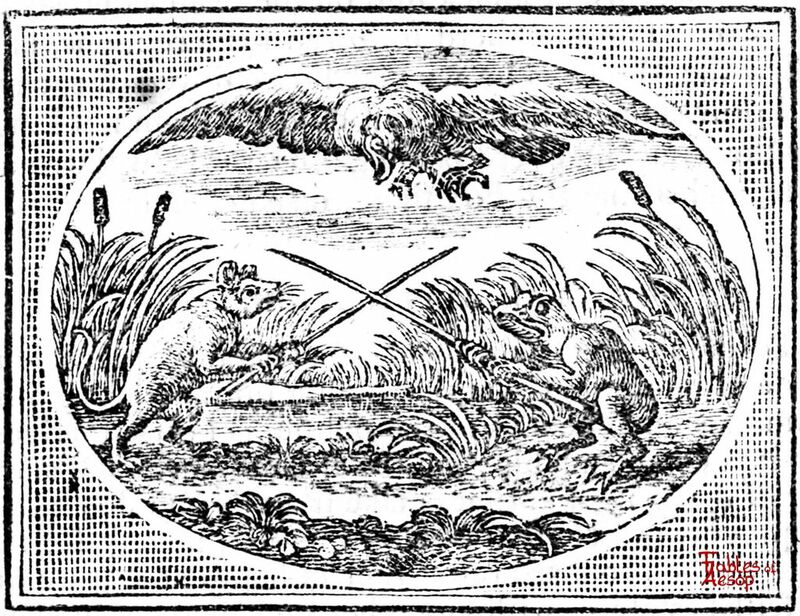 A Mouse and Frog fought so hard they did not notice a Hawk overhead. The Hawk saw them and swooped down and carried them both off to supper. A Mouse and a Frog got into a fight. They were so intent upon their fight they did not notice the Hawk circling overhead. The Hawk, however, saw them and while they were busy swooped down and carried them both off to supper. 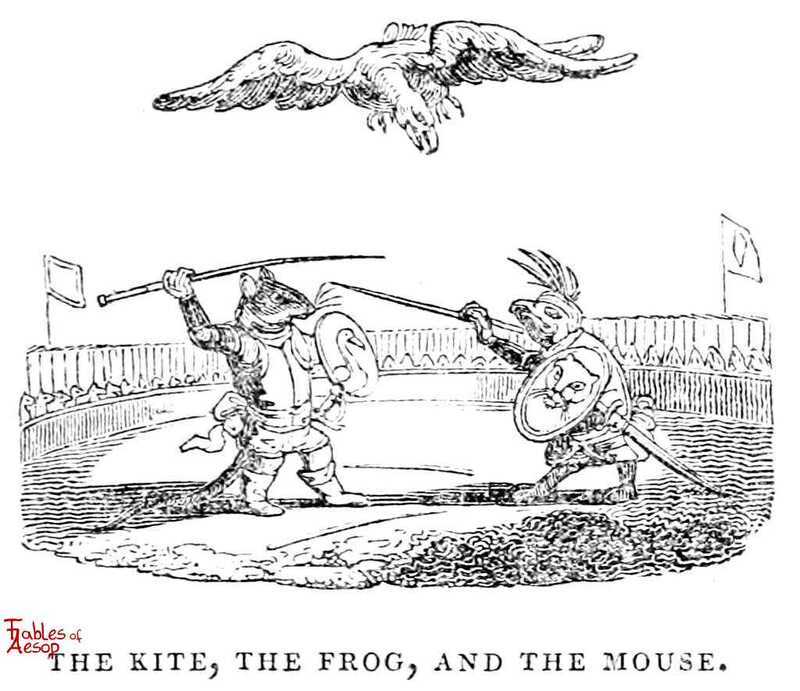 A Frog and a Mouse, who had long been rivals for the sovereignty of a certain marsh, and had many a skirmish and running fight together, agreed one day to settle the matter, once for all, by a fair and open combat. They met, and each, armed with the point of a bulrush for a spear, was ready, if need be, to fight to the death. The fight began in earnest, and there is no knowing how it might have ended, had not a Kite, seeing them from afar, pounced down and carried off both heroes in her talons. 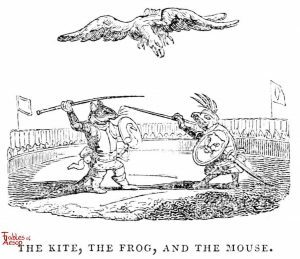 THERE was once a great emulation between the Frog and the Mouse, which should be master of the fen, and war ensued upon it. But the crafty Mouse, lurking under the grass in ambuscade, made sudden sallies, and often surprised the enemy at a disadvantage. The Frog excelling in strength, and being more able to leap abroad, and take the field, challenged the Mouse to single combat. The Mouse accepts the challenge; and each of them entered the lists, armed with the point of a bulrush, instead of a spear. A Kite sailing in the air, beheid them afar off; and while they were eagerly bent upon each other, and pressing on to the duel, this fatal enemy descended souse upon them, and with her crooked talons, carried off both the champions. Nothing so much exposes a man’s weak side, and lays him so open to an enemy, as passion and malice. He whose attention is wholly fixed upon forming a project of revenge, is ignorant of the mischiefs that may be hatching against him from some other quarter, and upon the attack, is unprovided with the means of defending or securing himself. How are the members of a commonwealth sometimes divided among themselves, and inspired with rancour and malice to the last degree; and often upon as great a trifle as that which was the subject matter of debate between the Frog and the Mouse; not for any rea! advantage, but merely who should get the better in the dispute: But such animosities, as insignificant and trifling as they may be among themselves, are yet of the last importance to their enemies, by giving them many fair opportunities of falling upon them, and reducing them to misery and slavery. O Britons, when will ye be wise! when will ye throw away the ridiculous distinctions of party, those ends of bulrushes, and by a prudent unioa secure yourselves in a state of peace and prosperity! A slate of which, if it were not for your intolerably foolish and unnecessary divisions at home, all the powers upon earth could never deprive you. 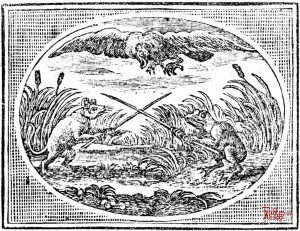 There fell out a bloody quarrel once betwixt the frogs and the mice about the sovereignty of the fenns; and whilst two of their champions were disputing it at swords point, down comes a kite powdering upon them in the interim, and gobbles up both together, to part the fray. ‘Tis the fate of all Gotham-quarrels, when fools go together by the ears, to have knaves run away with the stakes.